Time for a Huge Giveaway! Enter for Your Chance to Win Eight Books, Six CDs, and More! As many of you know, in less than one week I’ll be traveling to Sri Lanka with a group of World Vision bloggers. We’ll be reporting to you first hand about that beautiful country and the benefits of child sponsorship. To celebrate this coming journey, we’re having a little contest/giveaway. 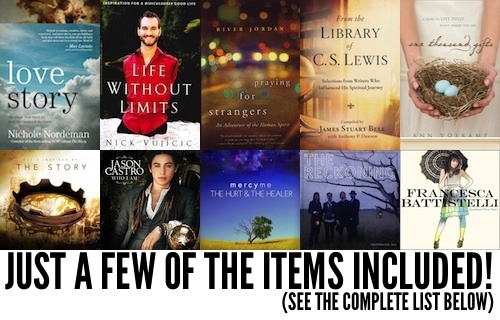 We’ve put together four identical prize packages, a collection of some of our favorite books, music, and World Vision apparel. To each of those four prize packs we will add something from Sri Lanka, a unique prize made by the people of Sri Lanka. -A copy of Music Inspired By the Story, a compilation CD that includes music by Amy Grant, Nichole Nordeman, Michael W. Smith, Natalie Grant, Jeremy Camp and many more. To enter for your chance to win, simply “like” World Vision’s Facebook page and each of the bloggers’ Facebook pages using the handy Rafflecopter tool (Note: you will need to be signed into your Facebook account for it to work) and you will automatically be entered to win one of the FOUR amazing prize packages. This contest begins on Thursday, August 16, 2012 and will end at midnight (PST) on Wednesday August 22, 2012. Winners will be selected at random. One winner per household. You must be 18 years or older and have a valid United States address to enter. No purchase is necessary. Winners will be contacted by email on or before September 10, 2012. Wow – what an amazing prize pack! And I challenge ANYONE to read “The Hole in Our Gospel” and not have their hearts forever changed. Looking forward to reading everyone’s perspective on the trip. Take care! You are going to see some amazing stuff. I can not wait to hear what you learn. This trip is going to be huge for you. I just know it. Great giveaway and can’t wait to follow your trip via all the blogs – what a great opportunity to get the Kingdom work in front of people in a new way.